Travel | International Conference "Dynamics of Systems on the Nanoscale"
Potsdam, located southwest of Berlin, is a former seat of the royal Prussian residence and a UNESCO World Heritage Site with an exquisite garden. The symbol of Potsdam is Sanssouci Palace. Frederick the Great had it built according to his own sketches in the middle of the 18th century and it was soon given the nickname of the 'Prussian Versailles'. The palace is only five minutes' walk from Steigenberger Hotel Sanssouci, an ideal starting point for a tour of Potsdam. You can get to Potsdam by train from the airports Berlin-Tegel or Berlin-Schoenefeld or from Berlin Main Station or by car. •	Berlin-Tegel Airport (located about 30 km from Potsdam). There are many options by public transport. One option is: Take the Bus 109 to “S-Bahnhof Charlottenburg”. From there take the S-Bahn S7 to Potsdam Main Station (about 55 min, Ticket “Berlin ABC”). Taxi fare is about 60 €. •	Berlin-Schönefeld Airport (located about 30 km from Potsdam). Take the regional train RB22 departing directly from the airport to Potsdam Main Station (about 50 min, Ticket “Berlin BC”). Taxi fare from the airport is about 60 €. •	From Berlin Main Station: Take the regional train RE 1 (25 min) or S-Bahn S7 (40 min) to Potsdam Main Station (Ticket “Berlin ABC”). •	From Potsdam Main Station: Take the Tram 91, Bus 605 or Bus 606 to “Luisenplatz Süd” (6-8 min, Ticket “Potsdam AB” or ticket Berlin region “C” is also valid within Potsdam). 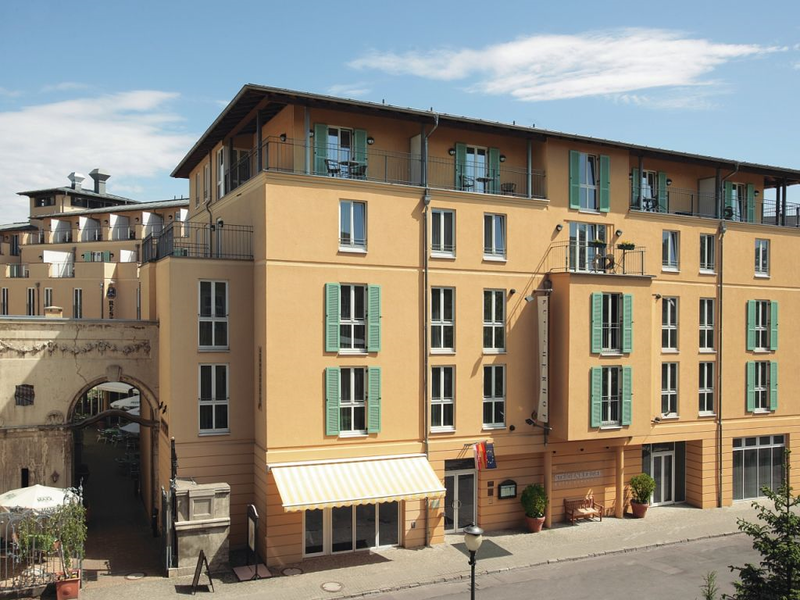 The Hotel Steigenberger can be found towards the north close to the entrance to Park Sanssouci. The train schedule and tickets can be found at www.bahn.de. By car: Potsdam can be reached from the A10 and the A115 Highway.